ExacTech has proven itself as a turnkey metalworking operation for over 25 years with some of the most experienced fabrication, machining, and assembly capabilities in Northeast Wisconsin. We offer a complete in-house solution for your products with over 80,000 sq. ft. of manufacturing space and an overhead lifting capacity of 100 tons which gives us the ability to out-lift the competition. 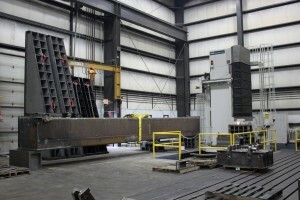 Our turnkey solutions and fast turnaround times make us the go-to fabricator for your project with custom mid to mega-size fabrication, burning and forming, precision machining and boring, and blast and paint all under one roof. This gives us the ability to handle the most complex of projects from start to finish, saving you time and money. By continuing to invest in the latest equipment and software, we ensure the highest quality for our customers. 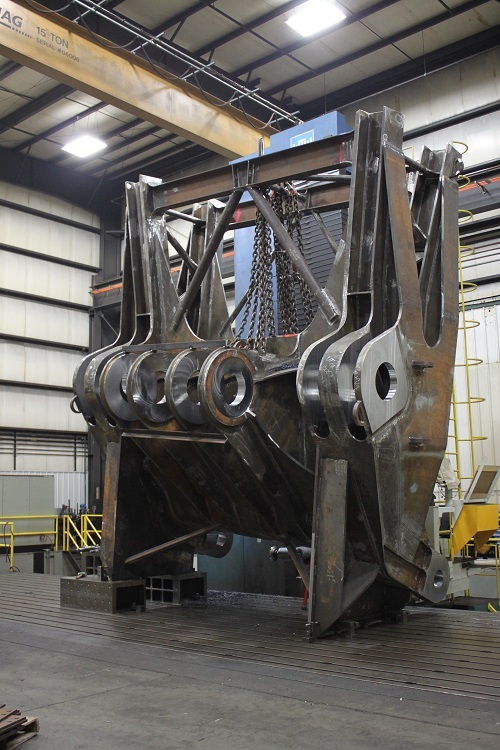 Our variety of heavy duty lifting and press equipment, along with hi-precision boring and cutting CNC equipment, are operated by the finest and most experienced machinists in the business. 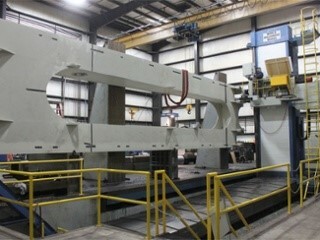 The WMW BP-180 CNC Traveling column boring bar with Fanuc 18MC control moves along the piece being worked on and allows for more area to be covered while doing so. With the traveling dimensions being X=36’, Y=16.5’, and Z=6’, the 7.1” spindle has more flexibility in its boring applications. The spindle motor has up to 80 HP to maximize material removal rate. The WMW BP-180 also has a right angle head to further increase capabilities. 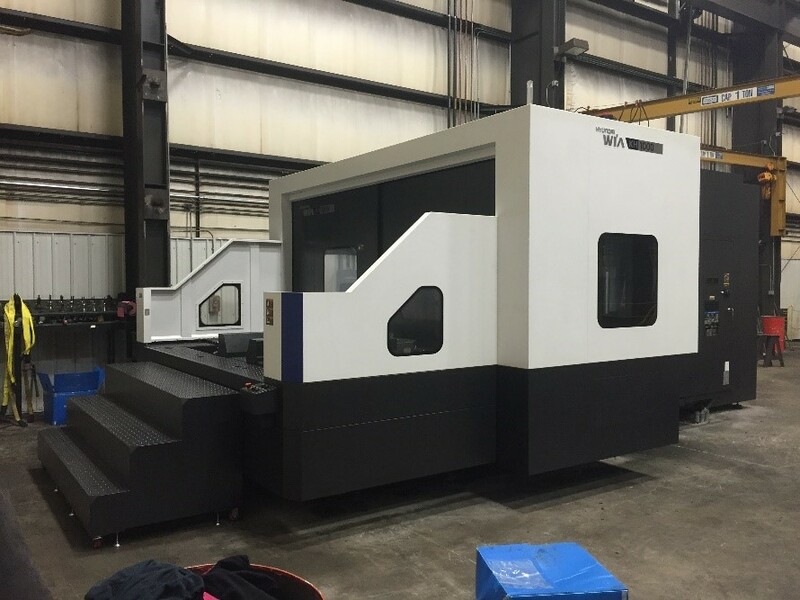 The KH1000 Horizontal Machining Center is one of our precision machining centers with a FANUC 31I-A Controller. With our 120 station tool changer, and a full rotary table measuring 39.4” by 39.4”, our customers are assured that every step of the process is done with the same care and precision we’ve built ExacTech’s reputation on. The Mighty SUMO VMC-2100 3- Axis vertical machining center also utilizes the Fanuc 18i-MB with a #50 taper and 10” chuck. Our turnkey capabilities and industry-leading lead times help set us apart from our competition. We pride ourselves on being able to handle all parts of your project’s development. 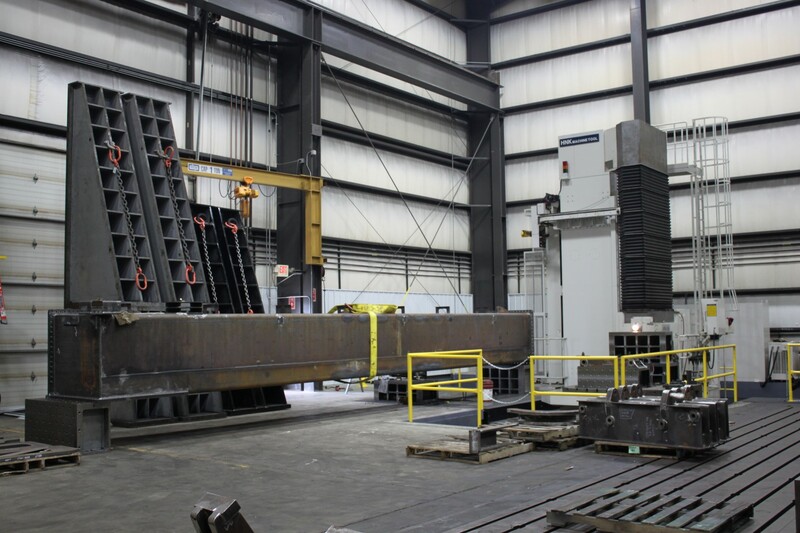 From mid to mega-size fabrication, burning and forming, precision machining and boring, and blast and paint capabilities, all of this is done under one roof with on-time delivery and with the quality our customers have come to expect and trust. We are continuously investing time and money in order to provide a turnkey solution designed to help increase your bottom line. To learn more, check out our website and follow us on social media! 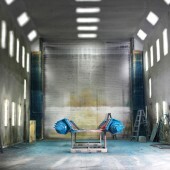 ExacTech’s blast and paint processes are driven by the customer’s individual needs. Each job at ExacTech, from the fabrication to final stages, is designed to meet the customer’s exact specifications. 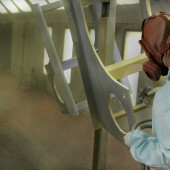 Prior to paint application, a blasting process takes place. The blasting of the steel uses abrasive and compressed air to remove and clean the surface of any previous paint coating, impurities and abrasive residue. At ExacTech, open air blasting uses compressed air and upper-end abrasive media are used to clean the surface of any potential paint residue, mill scale, corrosion or rust. Cleaning processes range from SSPC-SP6 to SSPC-SP10 standards, set by The Society for Protective Coatings (SSPC). SP6, or commercial blast cleaning, removes all rust, dirt, grease, oil, prior coating, and any other foreign material that is visible to the blaster. The SP6 cleaning process is based on a one-third to two-thirds ratio, where one-third of each square inch can have minimal streaks or stains. SP10 blasting requires a more in-depth clean blast, leaving only 5% of minor streaks and minimal discolorations visible while the remaining 95% are completely free of all other filtrates. ExacTech’s skilled team of painters work at military and marine standards with two paint booths measuring 18’ x 55’ and 20’ x 50’10”. 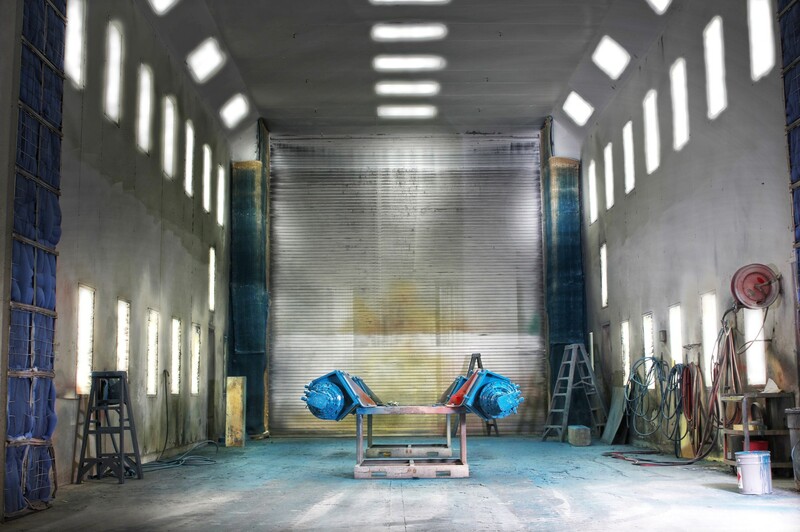 The two spray rooms can handle the most complex paint applications. Airless and conventional sprayers are used at ExacTech in order to provide various paint spray options when tackling each individual task. Airless paint sprayers pump paint at extremely high pressures. The paint is sent through a hose and through a tungsten carbide spray tip, in the paint spray gun, creating a broad, fan-shaped pattern of paint to be evenly distributed on the surface. There are many advantages of airless painting, such as a faster paint speed, consistent and high quality finish and the flexibility to paint on a wide range of materials. 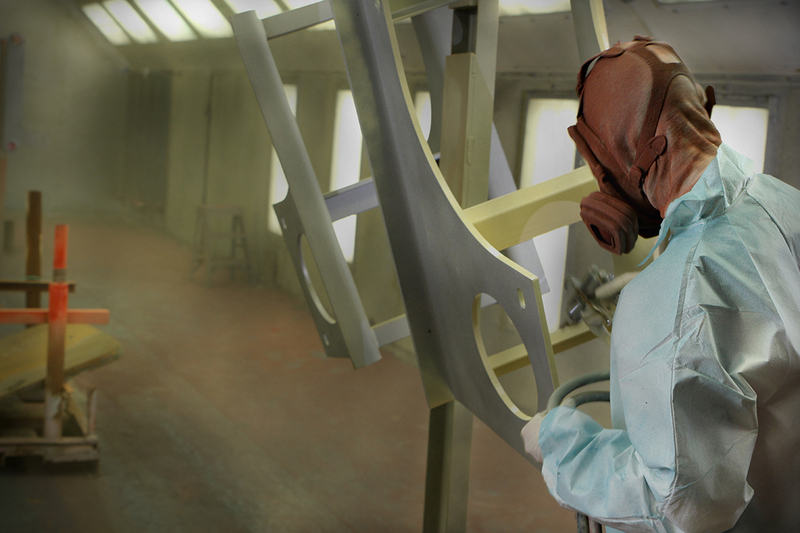 Larger, less complex surfaces are the best option for airless paint spray procedures. The conventional spraying process allows for more precise finishes due to the ability to regulate and control output and air pressure. Conventional spraying, also known as pressure pot spraying, is best suited for detail-orientated projects. Prior to blasting and painting, our painters make sure that ambient and surface temperatures are checked before beginning the process. ExacTech uses a dew point calculation chart to ensure that each blasting and coating application is performed under ideal environmental conditions. Dew point is measured to see if moisture will form on the service. If moisture is present, it can result in rust or residue to form on the surface. ExacTech measures dew point to work efficiently and avoid the need to backtrack and rework the blasting or paint process. After paint completion, product is inspected and dry mil readings are taken and recorded per paint manufacturer’s recommendations. In addition to the painting and assembly processes, ExacTech offers a number of turnkey capabilities that continue to exceed customer expectations. ExacTech’s cost effective processing and precision machining ensure the highest quality while cutting down on project overhead and expediting the entire fabrication process. ExacTech’s high-quality, precision fabrication is a result of nearly 25+ years of highly-experienced fabrication, machining and assembly that provides customers with a world-class turnkey operation. Since there is no wire that classifies as “one-size-fits-all,” ExacTech offers various wire options in order to provide only the best for our customers. Each wire has a unique job and reflects both the quality and durability needed for every individual task. The four specific ExacTech in-house wires consist of a 1/16 flux-core, a 3/32 flux-core, 1/8 submerged-arc wire, and a .052 metal core. 1/16 wire is utilized during applications needing both in and out position welding, allowing for good deposition rates. The 3/32 flux-core wire is used for some finishing passes and the filling of large bevels. The 1/8 sub-arc wire is used at ExacTech to weld flange plates together. The metal core .052 wire is primarily used to weld small parts, such as wheel frames to provide useful productivity. Flux-core and solid metal core wires provide the perfect balance when tackling each unique welding project in a time-efficient manner. Welders should take into consideration the proper shielding gas, voltage settings, thickness of material, and the location/atmosphere in which they are welding. 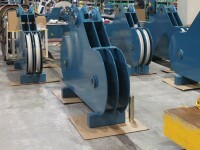 These factors help determine which wire should be used for each specific project. Flux-core wires contain their own shielding method, increasing the weld mobility. The shielding carbon dioxide gas allows for the electrode weld to be protected from oxygen, nitrogen and moisture in the air. Carbon dioxide flows through the welding gun, allowing a temporary gas bubble to form around the electrode for the duration of the weld. Pure CO2 gas has an easier ionization potential, higher thermal conductivity and is more reactive in comparison to using a combination of CO2 and argon gas which produces higher oxidization levels in the arc. Metal-core wires operate using a spray transfer mode, producing a broad, cone-shape arc resulting in a wide penetration profile. 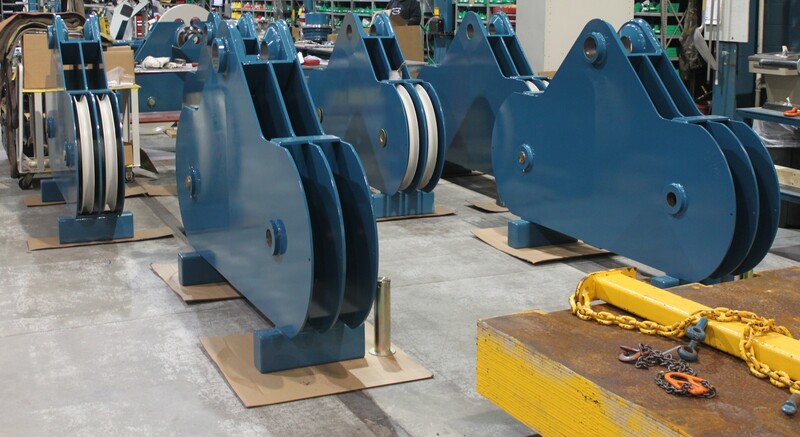 Metal core wires have high deposition rates and efficiencies, high duty cycles, high travel speeds, and low splatter levels. The .052 wire does not need a constant voltage power supply in order to operate, resulting in a much cleaner welding process. The inside of metal core wires contain metallic fillers and arc stabilizers that provide multiple benefits to the final weld, such as creating high impact strengths and reducing pre-welding activities through easy, consistent arc control. At ExaTech, welding with submerged arc wire allows for a clean and consistent weld for all large beam fabrication projects. 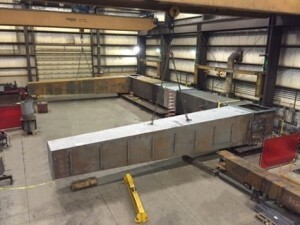 The first step to sub-arcing is to fit-up the flange plate and then by filling the machine one-half to three-fourths full with .052 metal core. Sub-arc welding requires the wire to be continuously-fed through the tractor sub-arc machine for the weld duration, resulting in a smooth and constant end result. The wire options utilized at ExacTech allow our welders to fabricate in the most practical manner on the market. The flux-core and solid metal core wires have different properties and are designed for various projects and environments. Sub-arc wire welding allows for a consistent and clean weld for all of our large fabrication projects. At ExacTech, high quality is in our roots, which is why we provide the highest quality wiring materials to meet your specs. Our products are streamlined to deliver high precision throughout the fabrication, machining and assembly processes which is why ExacTech’s wire options are adaptable to fit each unique welding task. The standard request for quotation (RFQ) process is one of the most common practices carried out by any purchasing manager; however, it is a process that often results in extensive turnaround times due to detailed pricing information and other selection criteria. With services and goods constantly evolving, it is critical for any organization to prepare and provide a qualified and competitive bid – The metal fabrication process is no exception. At ExacTech Inc., all incoming quotes are reviewed for material, weld, machining, paint, and any secondary requirements such as stress relieving. This assures a consistent, reliable bid day in and day out and an opportunity to gain business while earning the customers’ trust in the process. To begin the process, all incoming quotes are reviewed for material, welding, machining, paint, and any other secondary requirements that are necessary for the product. All quotes are entered into a “quote log,” which contains a due date in which we will provide the customer a precise quote. The material needed for each product is then reviewed for availability. Various departments assess what will be needed and how quickly they can receive the required supplies. By carrying out this process, ExacTech can ensure that all necessary materials will be available from the beginning stages to the final product. We review the customer’s due date once again in order to ensure that the due date can be met after consideration. ExacTech provides a quote for machining hours, tooling and material requirements, outside services, and the allotted fabrication hours. The quote is then assembled and reviewed for accuracy prior to submitting to our customers. 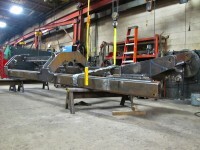 At ExacTech we review every fabrication process multiple times before sending a final quote to ensure our estimate is as precise as it possibly could be! The quote is submitted to the customer for review and consideration. ExacTech will initiate a follow-up call for any questions or concerns the customer may have regarding the estimate. At ExacTech, we take great pride in meeting and exceeding our customer’s strictest quality and delivery requirements. Follow this 7-step process to see how ExacTech is the perfect fit for all your turnkey solutions. STURGEON BAY, WI (March 9th, 2017) – ExacTech Inc. has recently announced the promotion of Jason Nessinger to General Manager. Nessinger started with ExacTech as a fabricator/welder in 2005 and has used his hands on experience, combined with a number of certificates from the Wisconsin School of Business, to continuously expand his role within the company. Nessinger currently oversees the entire ExacTech operation and has played a critical role in both the installation of the lean manufacturing process and the expansion of production capacity through the investment in heavy equipment. Through years of partnering with a variety of industries, Jason has developed the sales expertise and knowledge to execute best practices for creating maximum customer value. 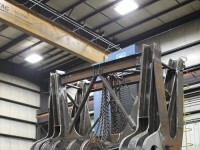 ExacTech Inc. continues to position itself as a leader in mid to mega sized projects with innovative equipment and an extremely diverse workforce. This wide range of capabilities has attracted a broad range of new customers and has kept existing customers coming back with advanced opportunities. To learn more about the continuous innovations happening at ExacTech Inc., visit the company overview video here. Through quality production and remarkable lead times, ExacTech continues to exceed expectations. To learn more about ExacTech Inc.’s custom metal fabrication capabilities, visit www.exactechinc.com and follow on LinkedIn and Facebook. On the cutting edge of contemporary machine centers, ExacTech Inc. is a world-class, turnkey metalworking operation that handles medium-to-heavy metal fabrication, ultra-precision CNC machining, burning, blasting, metal assembly and finishing services. 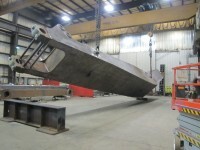 Located in Wisconsin, ExacTech’ s state-of-the-art metal and fabrication outsourcing facility serves customers throughout the continental United States, in Canada and overseas, and it has developed a solid reputation for high quality and precision tolerance work.